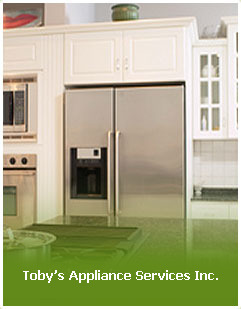 Toby's Appliance Services proudly provides top-quality appliance repair and servicing at competitive prices. Whether you need to install a new dishwasher or your refrigerator is on the fritz, we can fix it all. We offer experience and expertise on all brands, and we can get replacement parts for virtually any appliance. We'll always give you a free phone estimate, and we offer honest and affordable quotes.